The watermain in the Rabbittown area is scheduled for cleaning and structural lining from April to December 2018 in order to reduce maintenance issues and improve water service. 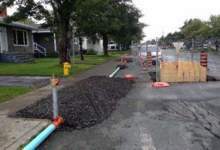 Businesses and homes will receive water through a temporary above ground water piping system installed along the street. Residents will be notified directly by the contractor if their property is included in the project area. Access is required to provide temporary water service. Two-way traffic and pedestrian access will be maintained where possible, delays are to be expected. Every effort will be made by the contractor to maintain driveway access to properties located within the work site.